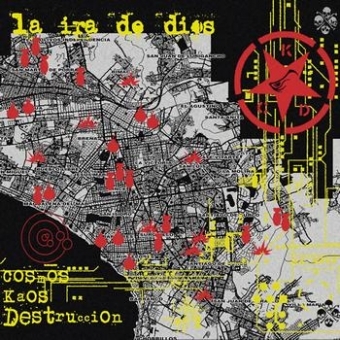 It seems that La Ira De Dios from Lima, Peru, refined their concept for a unique, raw and massive wall of sound for their third album. With the debut "Hacia el Sol Rojo" and the second album "Archaeopterix", released on the German stoner/space label Nasoni records, the group were quickly met with wide acceptance of fans and excellent critics from the international media - both albums reflect primarily the Hawkwind-style space rock with mostly long tunes and effects (this concept now covered with Obskuria -WIS 2003 features all La Ira members). Now the trippiest Heavy Underground band from Lima brings this new album to life "Cosmos, Kaos, Destruccion" containing 8 songs, riff orientated 3-7 min cuts with strong MC5, Motörhead and other "punk" influences, for sure it´s the most aggressive and heaviest album by this 3 piece line-up to date, which will satisfy fans of heavy acid garage rock or VoiVod´s early works! Released in a digipack cover with cool artwork and 8p. booklet. They say all good things come in threes, here´s the third album presented by World in Sound - Chapter 3 has begun, the intention is simple but challenging: Cosmos (Space), Chaos (Mindblowing) and Destruction (Aggression)! Get ready for MAXIMUMVOLUMEROCKANDROLL!! !